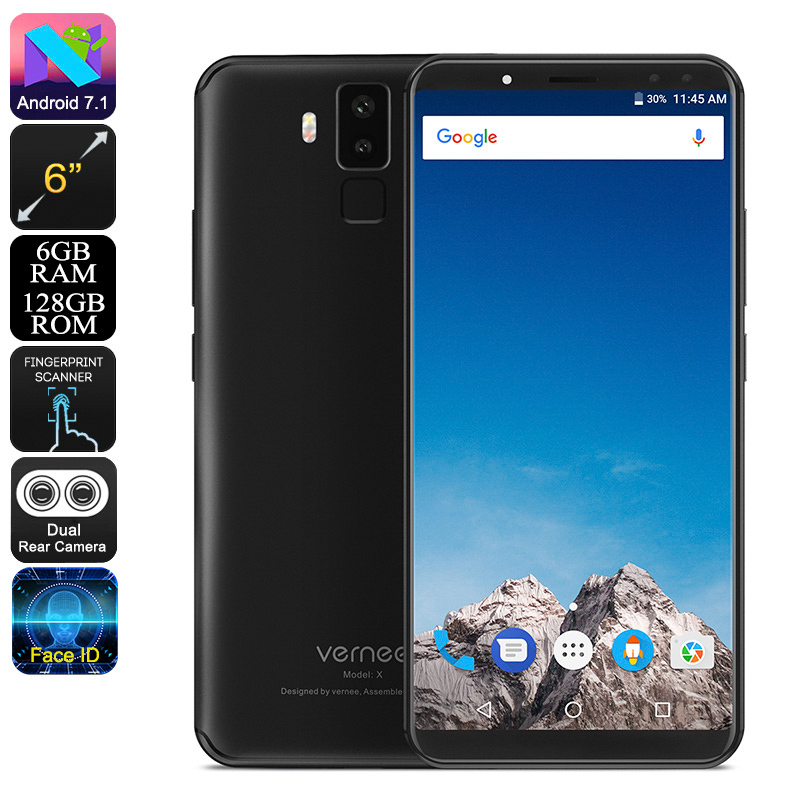 Successfully Added HK Warehouse Vernee X Smartphone - 5.99 Inch 2K Display, 6GB RAM, 4G, Face ID, Dual Front + Rear Cameras (Black) to your Shopping Cart. Vernee is a relatively new smartphone brand but that hasn't stopped them introducing some impressive smartphones. The Vernee X is a real treat at the price and a solid mid-range smartphone offering from the new kid on the block of smartphone manufacturers. The most noticeable feature of the Vernee X is its large 5.99-inch display. If you're a media lover or enjoy mobile gaming then the this is a good choice. The screen to body ratio is an impressive 83.8% and with 2K resolutions its sure to impress. The screen on the Vernee X smartphone isn't the only thing that is impressive. With 6GB of RAM and a Mediatek Helio P23 Octa Core CPU, (4 cores running at 2.5GHz and 4 running at 1.65GHz) this is a multitasking master. Add to that the new Mali G71 GPU and the Vernee X can run the latest games without dropping frames or and stutters. Coming with 128GB of onboard storage you get a lot of space for all your games, media and apps but should you need more the Micro SD slot can be used to double the available storage. Dual SIM slots and IMEI numbers allow you to use two SIM cards simultaneously in this smartphone, It offers a good range of 4G frequencies so you can make the most of fast cellular data plan stream movies and play online games on the go. Both the front and rear cameras on the Vernee X have dual lenses. The rear main lens is 16MP with a 5MP secondary lens to help with depth sensing and low light photography. To the front, the setup is a 13MP and 5MP setup. This lets you snap high-quality selfies and also provide the imaging for the Face ID security. So you can unlock this smartphone with your face! A massive plus for the Vernee X is the huge 6200mAh battery. Nearly double what most phones have and it should be more than enough for a couple of days of typical usage. In order to recharge the phone quickly, there is a USB type C port and fast charging technology letting you power up the battery with a 9V/2A charge so you a full charge takes under 2 hours.